Broad Street Block Party. Is this for real? Yes, it is and I just can’t believe it’s actually happening. 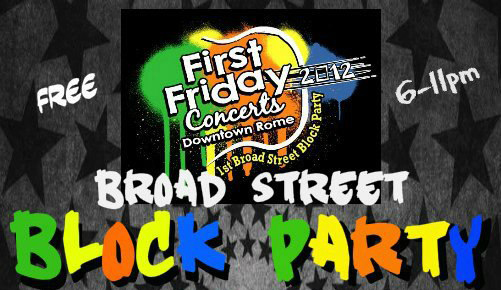 If you would have told me about this 5 years ago I would have said “No way, not here.” However, it is true and on Friday the 200 Block of Broad Street will be blocked off to vehicle traffic and three bands will rock the streets while 200 Block businesses serve alcohol that you can drink on the street. Pretty cool. The First Friday Concert Series is wrapping up it’s 14th successful season and I believe this will be the climax to the past 13 years. Jerry on the Moon, Curiosity Shoppe, and Kneckdown are all scheduled to deliver the tunes. The show starts at6 PM and is free and everyone is invited. You can’t bring your own alcohol to this one (you can at the Bridgepoint Plaza shows) and some folks may be disappointed, but at the same time why not support you local businesses and bring some booze money with you. I commend everyone at the Downtown Development Authority, the Downtown Business Improvement District, and my good buds at WLAQ 1410 AM and 95.7 The Ridge for making this magic happen. So lets all come out and have a good time. Just remember to play it safe and watch out for everyone else so that they can have a good time too. See you there! Posted in Uncategorized | Comments Off on Broad Street Block Party. Is this for real? You are currently browsing the The Rumpus Compendium blog archives for September, 2012.